内容简介：一、《中国社会统计年鉴—2016》是一部反映我国社会发展相关领域基本情况的综合性统计资料年刊。书中收录了2015年全国和各省、自治区、直辖市社会发展各领域的主要统计数据以及重要年份的全国主要统计数据,同时收录了国际社会统计的主要数据。 二、本年鉴正文内容分为13个篇章。即:1.综合;2.人口家庭;3.卫生健康;4.教育培训;5.就业;6.收入消费;7.社会保障;8.居住环境;9.文化休闲;10.资源环境;11.公共安全;12.社会参与;13.国际资料。附录为主要统计指标解释。 三、本年鉴所涉及的全国性统计数据,除行政区划、土地面积和森林资源及特殊注明外,均未包括香港、澳门特别行政区和台湾省数据。 四、本年鉴所使用的度量衡单位均采用国际统一标准计量单位。 五、本年鉴中部分数据合计数或相对数由于单位取舍不同而产生的计算误差,均未做机械调整。 六、本年鉴资料分别来自于:最高人民法院、最高人民检察院、教育部、公安部、民政部、司法部、财政部、人力资源和社会保障部、国土资源部、环境保护部、住房和城乡建设部、交通运输部、水利部、文化部、国家卫生和计划生育委员会、国家新闻出版广电总局、国家体育总局、国家安全生产监督管理总局、国家林业局、中国地震局、中国气象局、国家海洋局、国家文物局、中央统战部、国家档案局、中华全国总工会和中国残疾人联合会等部门。 七、符号使用说明:年鉴各表中的“空格”表示该项统计指标数据不详或无该项数据;“#”表示其中的主要项。 八、本年鉴编辑过程中,得到各相关部门的大力支持,在此表示衷心感谢。由于本年鉴涉及内容多、范围广,在资料的整理和编撰方面难免存在不足,敬请指正。 Ⅰ.China Social Statistical Yearbook 2016 is the comprehensive statistics yearbook whichreflects various aspects related to social development.It is collected main social statistical data onprovinces and national total data in 2015,also main social indicators of other countries/regions insome years. Ⅱ.This Yearbook includes 12 sections:1.General Survey,2.Population and Family,3.Healthand Wellness,4.Education and Training,5.Employment,6.Earning and Consumption,7.SocialSecurity,8.Living Condition,9.Culture and Leisure,10.Resources and Environment,11.PublicSafety,12.Social Participation,13.International Statistical Indicators.Explanatory notes on mainstatistical indicators are provided in Appendix. Ⅲ.The national data in this Yearbook do not include those of the Hong Kong SpecialAdministrative Region,the Macao Special Administrative Region and Taiwan Province,except forthe divisions of administrative areas,the area of the national territory and forest resources andotherwise specified. Ⅳ.The units of measurement used in the Yearbook are internationally standard measurementunits. Ⅴ.Statistical discrepancies on totals and relative figures due to rounding are not adjusted in theYearbook. 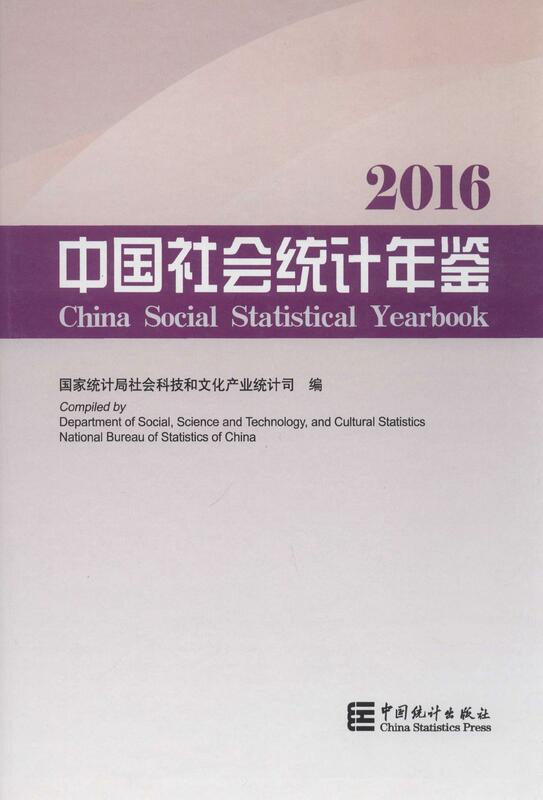 Ⅵ.Data in the Yearbook are sourced from the following departments:Supreme People's Court,Supreme People's Procuratorate,Ministry of Education,Ministry of Public Security,Ministry ofCivil Affairs,Ministry of Justice,Ministry of Finance,Ministry of Human Resources and SocialSecurity,Ministry of Land and Resources,Ministry of Environmental Protection,Ministry ofHousing and Urban-Rural Development,Ministry of Transport,Ministry of Water Resources,Ministry of Culture,National Health and Family Planning Commission,General Administration ofPress and Publication,Radio,Film and Television,General Administration of Sports,StateAdministration of Work Safety,State Administration of Forest,Earthquake Administration,Meteorological Administration,State Oceanic Administration,State Administration of CultureHeritage,the United Front Work Department of CPC Central Committee,State ArchivesAdministration,All-China Federation of Trade Unions,China Disabled Persons' Federation,etc. Ⅶ.Notations used in the Yearbook:(blank space) indicates that the data are unknown,or arenot available;“#” indicates a major breakdown of the total. Ⅷ.Our deep appreciation goes to many departments which provided supports in compilingthis Yearbook.It is inevitable that there might be some mistakes in the book because of widecoverage involved in collecting and compiling social statistics.Suggestions from readers arewelcome so as to improve the quality of this publication in the future.